How do I scan using Windows RT? Note: Make sure your product is set up on a network. You cannot scan with a USB connection. Touch: Swipe in from the right edge of the screen, then tap the Search charm. Mouse: Move the mouse pointer into the upper- or lower-right corner of the screen, then click on the Search charm. Keyboard: Press the Search charm key. 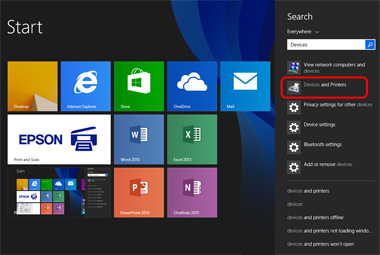 Enter Devices in the Search field, then select Devices and Printers. Select your product, then right-click or press and hold the product's icon, and select Start scan.